I am looking for the death certificate for Frances Sophia Smallwood nee Skiff. Frances was born in London in 1890. She was married to Arthur Smallwood. I know that she was living in Hollyburn, West Vancouver in 1937. She had a daughter called Iris Arthurina Smallwood, who married Bryan Lancelot Good and possibly a daughter called Eileen. Any other information on the family would be most welcome. No clue as to whether this one would be yours - Canada Voters List 1945 shows a Frances Smallwood (widow) - 2508 Marine Drive Vancouver. Marriage of daughter - Iris Arthurina Smallwood - 24 April 1937 - Hollyburn Canfield British Columbia. One of two hits that come up in a google search for "Arthurina Good" is a reference to divorce papers between Iris April Arthurina Good and Bryan Lancelot Good in New South Wales, Australia. Unfortunately the website seems to be down at the moment as I am having trouble accessing the link. Thank you, Sandra. I did have the marriage record but not the voting information. Thanks you, Linda. Yes, Bryan moved to Australia and remarried. I haven't seen any information regarding their divorce though. 4 1915 Richmond , Surrey. The birth registrations for Arthurine I Smallwood J-S 1916 Kensington 1a 127 and Eileen F Smallwood A-J 1918 Hendon 3a " see Sept 1921 " ( re- registration in 1921 ) both show mother's maiden name Stone. ( If this is correct there is a large age difference between the couple ). Thanks CB. Yes, that's right, Frances was born Sophia Frances Stone, but raised as Schiff, then Skiff. So it's all a bit confusing and sometimes she used Stone, other times, Skiff. I now think she married Arthur Smallwood in England and then Francis Willoughby Smallwood in Canada. I am not sure what happened to Arthur. Francis died at the end of 1944. 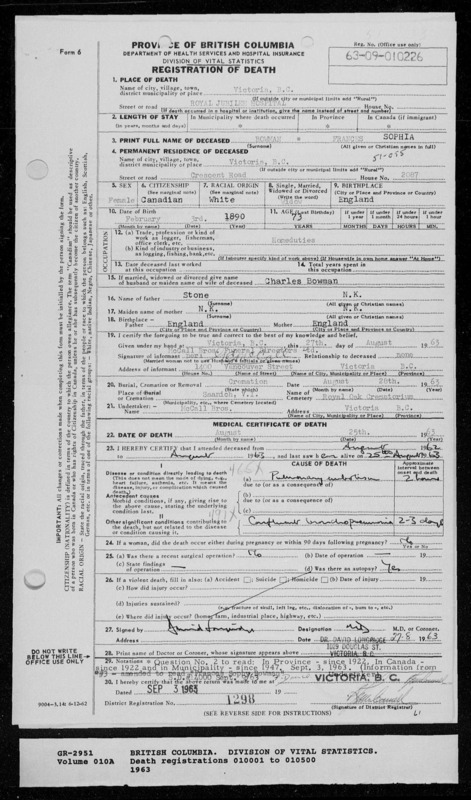 I was just about to write that I doubt that Frances would have remarried that quickly, until I saw the date of birth on the death record for Frances Sophia Bowman. Which is an exact match. So thank you very much, I think you have found the right one. And thank you again to everyone else who took their time to search for me - I really appreciate it. Someone else on the forum may have access to look at this obituary , dated 9 Jan 2013, and check the details. Arthur Thomas Smallwood , 370 Upper Richmond Road Putney, died 25 Nov 1922, Administration with Will ( limited ) to Henry Armstrong Smallwood , attorney of Frances Sophy Smallwood widow. Effects £ 50. Probate date 21 Dec 1925. Frances Smallwood 34, Ursuline Smallwood 9 and (private) Smallwood 3 sailed 6 Jun 1924 from Southampton to Quebec on the Antonia. Iris Smallwood 9 and Eileen 7 sailed 8 May 1925 Southampton to Montreal.